Cookies are one treat all kids jump for. I find cookies take so much more time to make then a cake because you have to keep putting batches into the oven. Also lately I've been having them end up flat. 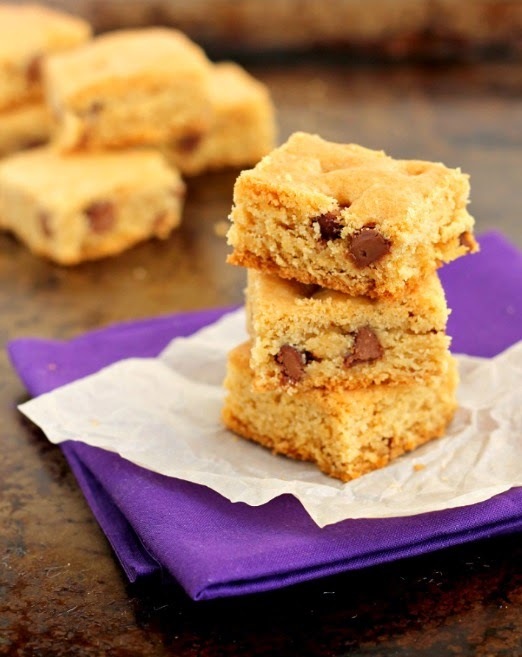 I love the idea of cookie bars where you spread the batter into a pan, bake and then cut them into squares. These cookies are a bit on the salty side so if you would like a sweeter cookie then reduce the salt. They also use oil instead of butter so no creaming butter and sugar which for me is a timesaver. The first time I made them we thought they were very tasty but a little greasy. So I reduced the oil. Less oil meant they required a little more effort to spread in the pan but we enjoyed more this way. These look great! I tried a recipe for cookie bars a while back and they didn't turn our good at all, but the texture of yours looks fantastic! Do these taste cakey, or are they studier than that? I would love to give these a shot; so much easier than making individual cookies! Thanks Henna! They are more sturdy than a cake. The batter is much thicker than a cake batter. I found this way of making cookies is such a time saver and my boys love cookies so much....they would have cookies over cake any day :). Let me know how they turn out if you give them a try!